No Chardy troubles here for the GOAT as he defeated the Frenchman 6-2, 6-1 in his first clay outing of 2015 at the Monte Carlo Rolex Masters. The match was a far cry from their encounter in Rome last year which ended in defeat for the Swiss but here he needed just 55 minutes to book his spot in the third round. It's the first time we've seen Fed since his Indian Wells final loss to Djokovic and after a brief holiday he's been training hard on the clay in preparation for Monte Carlo, Istanbul, Madrid and potentially Rome ahead of the French Open in Paris. Safe to say he looks in decent shape and has clearly been putting in the miles on the legs to build up the endurance required to have any success on the red stuff. Chardy won the toss and elected to receive and Roger held to 15 in relatively dull conditions to kick things off. At 1-1 the Swiss fired down a 50 second hold to move in front before breaking Chardy to lead 3-1 after the Frenchman double faulted on break point. 4-1 soon became 5-2 and with Chardy's serving becoming more erratic Roger broke for the second time to take it 6-2. 9 winners to 4 errors and winning 70% of second serve return points; very solid. Into the second and Roger immediately moved up a break to lead 2-0 after some sloppy play from Chardy. However this time around he failed to consolidate, giving Chardy a real buffet service game to get back on serve. Fortunately though Fed soon got himself back in front, converting his 4th break point of game 4 before reeling off the next 3 games to breadstick Chardy 6-1. No more drama in this one; just comfortable service holds, some nice volleying and a genius dropshot / lob / smash play that left Chardy out of ideas and on the train back to Liege. Pretty good start really for Fed here, he looked good on serve, mixed it up with some nice serve and volleys and looked solid from the back of the court. His backhand was in tip top form especially on the return which is always good to see and his movement was all very fluid. Chardy on the other hand was very poor; he only made the trip back from Houston 3 days ago and he's already played a singles match and a doubles so it could that the travel has caught up with him. He was clearly having problems with his serve as his ball toss was all over the shop, throwing it way behind his head en route to double faulting on break point in the first set. No patience from him either in the rallies and he bailed out of any medium to long exchanges with wild low percentage shots. As for the stats, it all makes nice reading in the far right hand column with Federer managing to hit 19 winners to 12 unforced errors, won 70% of second serve points and only faced the one break point which saw him drop serve in the second set which is the only real blemish. All tidy stuff and you can't ask for more in his first clay match of the year. Next up is Monfils who saw off Dolgopolov in two tie break sets to setup the tie with Roger. An impressive win for La Monf and although I expected him to come through I thought he'd have to do it in three. Like I said in my predictions post you only have to look at the US Open and the Davis Cup final encounter to know what Gael is capable off – huge groundstrokes, massive serve and a ridiculous athlete. It all just depends on what sort of mood he's in as to whether those facets of his game make an appearance on court. Roger dominates the H2H between the two but even in his wins it's not always straightforward and he will definitely have to be somewhere close to his best to ensure he gets the win and does so without having to fight it out over 3 tough sets. It's hard to really say where the match will be won and lost considering Monfils is so enigmatic but if Fed plays to his strengths (a la their Cincy match) and avoids letting Monfils get into the fun & games style of play he seems to enjoy then I think he gets it done in straights. 6-4 7-5. Comfortable start for Fed against a wayward opponent. Solid on the return and moved well. Nice, even shortened your name to maximise winning chances :lol. I edited it to Tommaso just so I don’t give first comment title to the wrong name. It was a scrappy game to get broken, mainly Fed errors. Was well in control through and broke immediately after to get back in front. No harm done. Nice and easy match for the champ – smooth as silk. Chardy played poorly, and double faults gifting Feds games, and eventually the match, but still, thought Feds looked very sharp. Good first match, very little energy expended fortunately as he will need plenty of that against La Monf. Great match between the Dog and Monfils – exciting to watch – they have a similar outlook I think – both a little crazy, and clearly enjoying every minute of their match, as were the crowd. I was hoping the Dog might make it, as he is a second favourite of mine. Sounds like Fed had some (light) rust to shake off but did so pretty quickly – doesn’t sound like Chardy was anything like his best though. A solid start for our guy. Outstanding 1st serve %, even when taking into account that Chardy wasn’t returning terribly well. Oh, & I really like this outfit! The outfit is cool. The stripe on shorts still a let down though. I was thinking of buying the polo, then just find last years blue gladiators with non stripe. Winning. You get 10% off sale items on the Nike site too now with the Tiger Mobiles Tennis Challenge and 10% of Color13 if anyone is interested, all on the perks page. I only got to see the highlights, but from that I noticed that Fed approached the net very very often. It’s almost as though he’s saying it’s clay, so I DEFINITELY don’t want to get into rallies. So it’s all or nothing. Was that the case? I quite enjoyed it!! 2004 Henman esque. Got him to semi finals. Yep Chardys travels finally caught up with him and seems Rog was steady! Serve stats look great and that is crucial v Monfils. Hold easily and then get into the Monf service games with confidence. Yeah Monf will always throw in a dud service game slipping to 0-30 with some wild shots, Fed gotta take advantage. On clay Monfils just refuses to play any kind of attacking tennis. He’s one of the best retrievers but it’s kind of annoying because of how good he could be. But then I’m not complaining as it just plays into Roger’s hands! Expect Gael to take Nadal-like court positions and trip over a ball boy and the scoreboard. Drop shot will be profitable because even though LaMonf is fast he doesn’t actually play a decent shot on the dead run when he gets there. If Roger plays his game he’ll win in straights no sweat. Dunno, some of those flying shots when he’s “on” sure seem to have a lot on them. 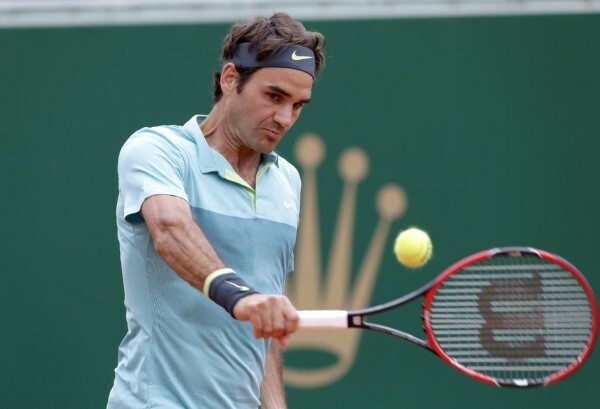 If he can play like he did in DC Roger will have his work cut out for him – obviously the dynamic will be different since Roger himself is in a much better place. All depends on his mood, Monfils can be the biggest pusher going on any surface but if he flattens it out then he hits huge. Dunno about dropper, you have to execute it close to perfect for it not to be tracked down. Court position for Fed will probably be key, if he can hold the advantage there and not have to defend more than attack should be fine. Wow this match was incredibly dull as was the crowd at the Monte Carlo Country Club. 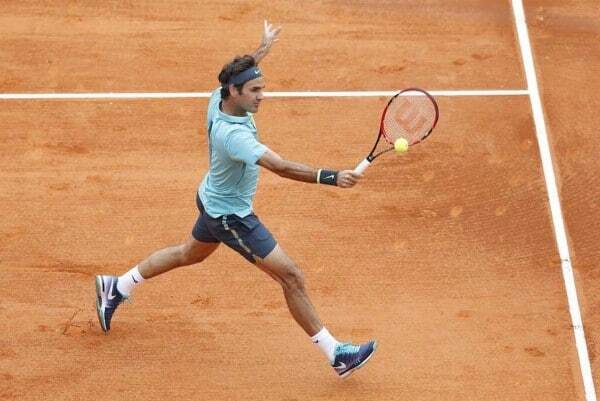 Solid first outing on clay for Roger but hoping it picks up the pace for the rest of the week. Guess that’s when you clay season is upon us! Off To Monte-Carlo without tickets, wish me luck! Looked like plenty of spare seats yesterday so I’m sure you will be fine. I remember when you did this last year – hope you got to see him – maybe have some theories about what happened??? Off with a convincing win, thanks Jonathan. I actually looked their head-to-head stats before the match and noticed that Chardy took a set off Roger on each occasion. This one put Chardy in his place 🙂 . Saw a little highlight, Roger played well but gave Chardy quite a few mid-court balls. I am sure that Roger will do better against Gael today! Chardy is dangerous but he was way below his usual level yesterday, couldn’t serve for toffee. It wasn’t a high quality match, Fed played ok really just didn’t serve well enough. To watch Federer lose is painful enough. To watch him lose to this effing clown is the worst. Monfils is a great player though, huge shots off both wings. Always liable to go mental walkabout but no shame in losing to him. Man a life just when thought it was safe to go back in the water! !! Lol. Didn’t watch the match but it looks like Federer must of played pants. Especially with 34 is it UF errors! !! I have never liked Clownfils, when he plays I know it’s his style but I think its disrespectful to all tennis players with all this unessasary jumping up and down and trying crappy trick shots all the time. And then when he finally pulls one off the commies come out in force with such drivel and explanation of style over substance. Watch he will probably lose next round. So whats the point of beating a player of caliber of Federer. I know Federer cant win all the time but its worst when someone like Clownfils beats him when Federer is having a bad day at the office or just playing bad due to injury, jet lag or when he can’t be bothered to concentrate because he is thinking about what next do I buy today with my hundreds of millions in the bank. Anyway move on to the next chapter and tournament. What goes down can only go up!! Let’s hope for a better and more consistent performance from Federer! !! I hope he feels ‘Betterer’ at the upcoming events. Just inoyed that he will be losing some heafty points here at Micky Carlo. I want him to get as much points he can now without stupid setbacks like this. And I was wondering when Federer was saying at his interviews and press conference that he is feeling good and he had a good training stamina work out during his extended break instead of playing at Miami. I know the conditions are really slow and crappy but I think he would of gone a bit more deeper into that tournament than what has happened today. Anyway lets see all is not lost! ! Fingers crossed! ! Plus he can only gain in Madrid – assuming he doesn’t drop Rome. Hey guys, I am getting pretty tired and annoyed of this green…smurf/clown. First… his clothes?? What was that?? How… did he approve that? Who made it?? That clothing company should be getting in the middle of a town square and we all should throw tomatoes at them. Yak. And then he wins too?? Really God?? But oke, I guess he played well. So did Roger, but it just wasn’t meant to be. No worries Goat, season is still long. Nothing can make me not proud of the Goat, not even a loss to that green clown 🙂 Still proud of you Roger. No matter what. Would have loved it if you had won. Unfortunately you made some bad choices at key moments. I do hope that Roger doesn’t lose a lot of points?? Stan the Man had to play Dimi. Roger had to play the clown. Jo Willy had to play Cilic. Ferrer had to play Simon. Berdych and Raonic had strong opponents as well. Even Rafa had to play Isner. And Novak had to play who?? Haider Maurer?? Who?? Easy draw much?? Also ps: Monfils is becoming a problem for Roger or what?? He beats him in Paris or Shanghai, Davis Cup, almost beats him at the USO and now here?? This is seriously someone who plays great, but also like an entertainer, but when he plays Roger, he suddenly remembers how great he is and can be?? I hate when they figure that out while playing Roger. 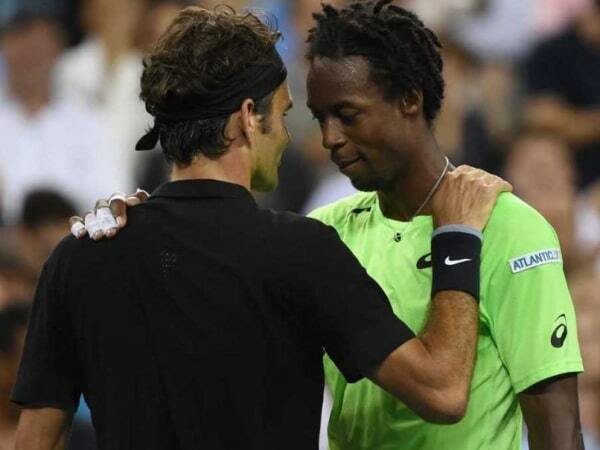 Well… have to be honest too, kudos to Monfils for playing a great match, but more importantly… for not making a big deal about defeating Roger. And what did you do Seve?? Weren’t you watching Monfils play the match before and didn’t you take notes?? Ps: Stan… couldn’t you have played this kind of match during last year’s final??? 510 point loss I think. Oh dear, Wanda. Did you see this match. This was a bummer. Pack up the fam and back home before you know it. Were the fam there? And what about Mirka? I know she was there at the weekend, but was that only because it was their anniversary? Watched it on record. Fed not that bad altho 1st serve deserted him. Most of his balls were out by tiny margins. Monf just turned up as he can and didn’t clown. Fed also got into too many rallies where He tried to pull the trigger too fast, also where was his slice? Thought he may struggle. Damp sticky sludgy court. Clay? Meh! So, any obvious reason why FS went AWOL? Watching bits of it from the livescores, it seemed very odd: Fed seemed to be stuck in treacle, and just unable to pull away from Monfils – 15-0, 15-15, 15-30, 30-30, 40-30, deuce and so on. And then the livescores went and got stuck in the TB, and I had no idea what was happening! I thought he seemed to start off well, but as soon as I went to the results page to see what had happened between Dimi and Stan it went downhill! Disappointing, but by no means a total surprise.